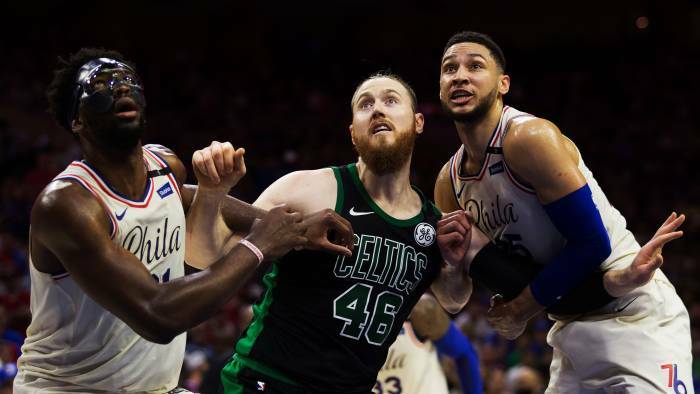 The Boston Celtics were underdogs upon entering the 2018 playoffs despite holding the No. 2 seed in the Eastern Conference. The Celtics were bogged down with injuries and it even seemed like some teams were trying to fall into the No. 7 spot to match up with them, expecting they could pull the upset with Kyrie Irving, Gordon Hayward, Marcus Smart, and Daniel Theis out. Instead, Boston shocked just about everyone. They battled with the Milwaukee Bucks, eventually taking them out in seven games to advance to the Eastern Conference Semi-Finals against the Philadelphia 76ers. The 76ers were one of the hottest teams in the league behind the youth of Joel Embiid and Ben Simmons, not to mention the broken jumper of Markelle Fultz. They won a whopping 16 straight games down the stretch of the regular season prior to the playoffs and then dispatched the Miami Heat 4-1 in the opening round. No one was sure how Emiid and Simmons would be slowed down. And that wasn't even mentioning the hot shooting of role players like JJ Reddick, Marco Belinelli, and Ersan Ilyasova off the bench. Once again, Boston relied on tough-nosed defense and a young offense led by Jayson Tatum. After a hard-fought series with plenty of dustups, technicals, and flagrant fouls, the Celtics came out on top 4-1. Though the series was much closer than the final score made it look. Each game could've gone either way. Now, it seems like this budding rivalry will get some fuel tossed on the fire early in 2018. Gary Washburn of the Boston Globe reported earlier this week that the season-opening matchups on TNT will likely include Boston-Philadelphia. I guess that means we just get to see more of Aron Baynes living rent-free in Embiid's head. What a way to welcome Gordon Hayward back to action. The Garden should be rocking like a championship banner is being raised to celebrate Hayward's return. Follow Dustin Lewis on Twitter for more news and coverage of the Boston Celtics.